G protein-coupled receptor (GPCR) is a general term for a large class of membrane protein receptors, which also known as seven α-helices transmembrane segment receptors (7TM receptors). It binds to extracellular molecules and activates internal signal transduction pathways, ultimately activating cellular responses. GPCRs are named for their ability to bind and regulate G protein activity. They mediate signals involving visual control, kidney function, tumorigenesis, immune response, and inflammation. In 2000, the first crystal structure of mammalian GPCR, bovine rhodopsin (PDB1F88), was discovered. In 2007, the crystal structure of the first human GPCR-the β2 adrenergic receptor, was analyzed. The GPCR structure is very similar to bovine rhodopsin. In 2011, the high resolution structure of human β2 adrenergic receptor and Gs heterotrimeric complex was analyzed. In 2012, Brian Kobilka and Robert Lefkowitz won the 2012 Nobel Prize in Chemistry for their outstanding contributions to the field of G-protein coupled receptors. Kobilka et al. reported the detailed crystal structure of the G protein-coupled receptor (GPCR) complex, a discovery that is truly a breakthrough. In 2015, the crystal structure of the first intact complex of rhodopsin and visual arrestin was analyzed. Nearly 2000 different GPCRs have been reported so far. GPCRs are a family of intact membrane proteins with a conserved spatial structure. 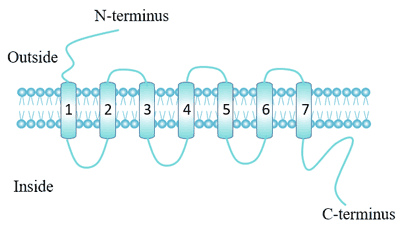 Each receptor contains seven alpha-helix transmembrane domains, which start at the N-terminus of the outer membrane and end at the C-terminus of the inner membrane, with three extracellular loops and three intracellular loops . The extracellular part of the receptor can be glycosylated. Two highly conserved cysteine residues of the extracellular loop can form disulfide bonds to stabilize the receptor structure. Class A: rhodopsin-like receptors Transduce extracellular signals through interaction with guanine nucleotide-binding (G) proteins. Class B: secretin receptor family These receptors activate adenylyl cyclase and the phosphatidyl-inositol-calcium pathway. Class D: Fungal mating pheromone receptors Involved in the response to mating factors on the cell membrane. Class F: Frizzled/Smoothened family. Governing cell polarity, embryonic development, formation of neural synapses, cell proliferation, and many other processes in developing and adult organisms. Despite the lack of sequence homology among classes, all GPCRs share the same signal transduction structure and mechanism. The largest class is class A, which accounts for nearly 85% of the GPCR gene, and most of its receptors are predicted to encode olfactory receptors. Group A was further subdivided into 19 subgroups (A1-A19). In recent years, the concept of orphan receptor has been proposed, which refers to the receptor whose endogenous ligand has not been found. The first successful example of "orphan removal" by reverse pharmacology is opioid receptor ORL1  . Other Classification Methods: Recently, a new classification system is proposed: GRAFS classification system (Glutamate, Rhodopsin, Adhesion, Frizzled/Taste2 and Secretin). Bioinformatics prediction methods also have been used to predict the classification of GPCRs. Ligand binding to G protein-coupled receptors mediates cellular signaling processes. These ligands can be small molecules of sugars, lipids, polypeptides, or biological macromolecules such as proteins. Some special G-protein-coupled receptors can also be activated by non-chemical stimuli. 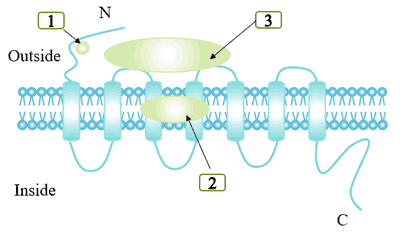 For example, rhodopsin in photoreceptor cells can be activated by light. Biogenic amine hormones: epinephrine, norepinephrine, histamine, serotonin. Peptide hormones: such as bradykinin, luteinizing hormone, parathyroid hormone. An agonist is a ligand that biases the equilibrium to an active state, and the receptor is further coupled to a G protein heterotrimer to transduce the ligand signal into the cell. An inverse agonist is a ligand that biases the equilibrium toward an inactive state. Neutral antagonists are ligands that do not affect balance. There are certain differences in binding sites depending on the size of the ligand. Some small molecular ligands, such as norepinephrine, bind in the deep part of the cell membrane and require the involvement of key residues in TM region. Other ligands form different degrees of binding with the outer surface of TM segment and the N-terminal region. Binding cracks formed by alpha helix transmembrane. The extracellular domain of the receptor. Some ligands interact with both binding cracks and extracellular domains. Vision: Rhodopsin is a class of G protein-coupled receptors that can sense light, which converts 11 cis-type retinal into full-trans-type retinal by photoisomerization reaction, thereby converting electromagnetic radiation into cell signal and triggering downstream signal transmission process. Taste: GPCRs can mediate the release of bitter, umami and sweet substances by gustducin. Osphresio: Olfactory epithelium in the nasal cavity and olfactory receptors on the vomeronasal organ can sense odor molecules and pheromones. Behavioral and Mood Regulation: Neurotransmitters such as serotonin, dopamine, GABA, and glutamate bind to G-protein coupled receptors in the brain of mammals. Immune System Regulation: Chemokines function by binding to G-protein-coupled receptors. GPCRs are involved in immune regulation. Many mediators of immunity or inflammation, such as histamine, purine nucleoside and prostaglandin, transmit signals through GPCR. Regulation of the Autonomic Nervous System: Regulation of the autonomic nervous system: the G protein-coupled receptor signaling pathway regulates the activities of sympathetic and parasympathetic nerves, which control many physiological functions of self-discipline, including blood pressure, heartbeat, digestion, etc. Regulation of Cell Density: A recently discovered g-protein-coupled receptor with lipid kinase activity regulates the sensitivity of dictyostelium to cell density. Homeostasis: The regulation of water balance in the body. To date, thousands of GPCR species have been found in animals. However, only one single GPCR has been isolated from peas  and maize in plants. Computational analysis shows that GPCR also exists in arabidopsis thaliana, poplar and rice . GPCRs are involved in signal transduction pathways in plants and can affect a series of metabolic and differentiation activities. GPCR in arabidopsis thaliana has been reported to regulate cell cycle  and is involved in ABA and stress signaling . To date, only one putative GPCR (GCR1) has been identified and experimentally studied in Arabidopsis . Bacterial signaling molecule-mediated exchange of information between species. The G protein is a trimer composed of three subunits of α, β, and γ. The G protein coupled receptors bound to ligands undergo conformational changes, thus showing the characteristics of guanylate exchange factor (GEF). The alpha subunit of G protein is separated from beta and gamma subunits by exchanging the originally bound guanosine diphosphate (GDP) on G protein with GTP . Gα-GTP and Gβγ can act on effector proteins and further trigger a series of downstream effects, and the specific signaling pathway involved depends on the type of G protein. After Gα-GTP exerts its effect, α subunit uses its own GTPase activity to hydrolyze GTP to GDP, and then binds to the βγ subunit to re-form the inactive G protein trimer. G protein is a protein that can bind to guanine nucleotides and has GTPase activity. It is composed of α subunit, β subunit and γ subunit. Alpha subunits are divided into four families: Gs, Gi, Gq, and G12. Gs family can activate adenylate cyclase, Gi family can inhibit adenylate cyclase, and Gq family can act on phospholipase C. Activated Gα can affect and regulate many effector molecules such as Ca2+, K+ channels, adenylate cyclase, phospholipase C (PLC), phospholipase D (PLD), and protein kinases. Generally, beta and gamma subunits exist as a noncovalently bound complex. The βγ dimer can positively regulate downstream effectors and many effectors other than K+ ion channels, including adenylate cyclase, hydrolyzed phospholipase C-β (PLC-β), hydrolyzed phospholipase A2 (PL2), PI3-kinase and β-adrenergic receptor kinase  . Gβγ can also activate the Gα subunit . GPCR is currently a highly concerned receptor superfamily, which is generally capable of activating G protein. 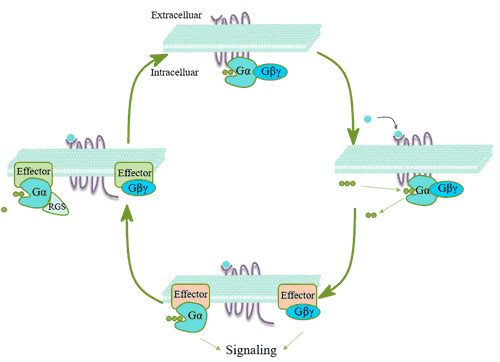 Its signal transduction process consists of receptor (GPCR), transmitter (g-protein) and effector. 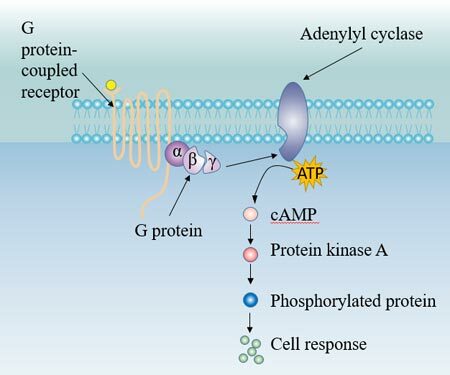 The hormone acts on the corresponding receptor on the target cell membrane, and activates the intramembrane adenylate cyclase (Ac) via G-protein coupling. In the role of Mg2+, adenylate cyclase catalyzes the conversion of ATP to cAMP. cAMP, as the second messenger, activates cAMP-dependent protein kinase (PKA), which in turn catalyzes phosphorylation of various substrates in the cell, and finally leads to biological effects in the cell, such as cell secretion, muscle cell contraction, cell membrane permeability changes, and various enzymatic reactions in the cell. Insulin, oxytocin, prolactin, and hypothalamic regulatory peptides bind to membrane receptors and, via G-protein coupling, activate the intramembrane effector enzyme- Phospholipase C (PLC), which decomposes phosphatidyl diphosphate inositol (PIP2) to produce inositol triphosphate (IP3) and diacylglycerol (DG). As a second messenger, IP3 and DG play a role in information transmission in cells. Desensitization refers to the mechanism of shutting down the receptor to prevent excessive irritation in the continued presence of the ligand. 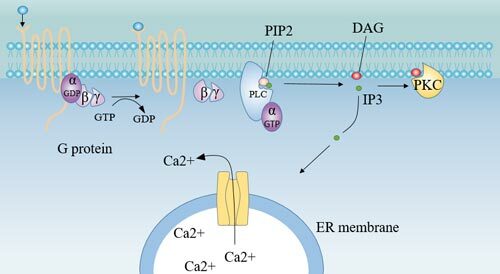 Receptor desensitization is related to receptor phosphorylation, and receptor internalization is also an important molecular mechanism for GPCRs desensitization. The mechanism is shown below. 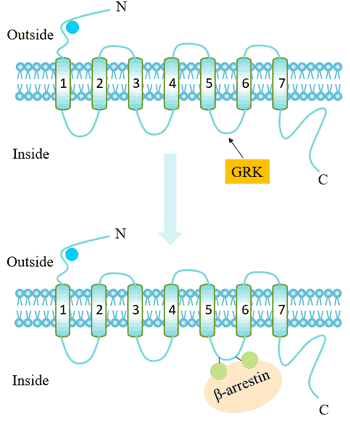 The G protein receptor kinase (GRK) recognizes and acts on a receptor that binds to an agonist, phosphorylating specific residues on GPCR. This increases the affinity of the GPCR for the beta-arrestin protein. Beta-arrestin binding can target receptor endocytosis, resulting in a decrease in the number of cell surface receptors (receptor internalization). Receptor internalization, also known as the intracellular attachment of activated receptors, has been a hot topic in recent years. GPCRs internalization may involve multiple endocytosis mechanisms . GPCRs are involved in various physiological functions of human body, including nerve signal transmission, cell differentiation, vision, smell, etc.  . In addition to its central role in signal transduction, GPCRs are also "stars" in the field of drug development. GPCRs is associated with major human diseases such as cancer, AIDS, heart disease, diabetes, Alzheimer's disease , Parkinson's disease, dwarfism, achromatopsia, retinitis pigmentosa and asthma. GPCRs is an important drug target, and currently about 40% of the marketed drugs are designed based on GPCRs . About 34% of drug targets approved by the food and drug administration (FDA)  are members of this family. According to reports, among the currently marketed drugs, 20% of the top 50 best-selling drugs belong to G-protein receptor-related drugs, such as Coeg, a congestive heart failure drug; Cozaar, a Hypertension drug; Zoladex a breast cancer drug. Targeting GPCRS, new anti-tumor drugs can be developed . Drugs with high affinity for the active conformation of the receptor can make the dynamic balance move from the inactive conformation to the active conformation, and enhance the signal transduction and pharmacological effects of the receptor. The affinity of the drug to the inactive conformation is higher than that of the active conformation, and the dynamic equilibrium of the receptor moves toward the inactive conformation. The drug has the same affinity for the receptor's inactive conformation and active conformation, does not produce biological effects, and can compete against agonists and reverse agonists. A typical drug is propranolol acting on beta adrenergic receptors. Regulator of G-protein signaling (RGS) is a family of proteins that can regulate signal transduction through G protein. RGS acts on GTPase activity, reducing the signaling process mediated by receptor activation, thereby impairing the effects of agonists. Some RGS can also directly antagonize Gα effector molecules, block signaling to effector proteins. It may also antagonize Gβγ-mediated biological effects by binding to β subunits. They can also bind directly to receptors or act as g-alpha effector molecules to regulate signal transduction pathways. Strader C D, Fong T M, Tota M R, et al. Structure and Function of G Protein-Coupled Receptors [J]. Annual Review of Biochemistry, 1994, 63(1): 101-132. Kolakowski L, Kolakowski L J, Kolakowski L F. GCRDb: a G-protein-coupled receptor database [J]. Receptors Channels, 1994, 2(1): 1-7. Meunier J C, Mollereau C, Toll L, et al. Isolation and structure of the endogenous agonist of opioid receptor-like ORL1 receptor [J]. Nature (London), 1995, 377(6549): 532-535. Reinscheid R K, Nothacker H P, Bourson A, et al. Orphanin FQ: a neuropeptide that activates an opioidlike G protein-coupled receptor [J]. Science, 1995, 270(5237): 792-794. Misra S, Wu Y, Venkataraman G, et al. Heterotrimeric G - protein complex and G-protein coupled receptor from a legume (Pisum sativum): role in salinity and heat stress and cross-talk with phospholipase C [J]. Plant Journal, 2010, 51(4): 656-669. Gookin T E, Kim J, Assmann S M. Whole proteome identification of plant candidate G-protein coupled receptors in Arabidopsis, rice, and poplar: computational prediction and in-vivo protein coupling [J]. Genome Biology, 2008, 9(7): R120-R120. Gabriella C, Fabio A, Nicole A, et al. GCR1, the putative Arabidopsis G protein-coupled receptor gene is cell cycle-regulated, and its overexpression abolishes seed dormancy and shortens time to flowering [J]. Proceedings of the National Academy of Sciences of the United States of America, 2002, 99(7): 4736-4741. Pandey S, Assmann S M. The Arabidopsis Putative G Protein-Coupled Receptor GCR1 Interacts with the G Protein α Subunit GPA1 and Regulates Abscisic Acid Signaling [J]. Plant Cell, 2004, 16(6): 1616-1632. Warpeha K M, Upadhyay S, Yeh J, et al. The GCR1, GPA1, PRN1, NF-Y Signal Chain Mediates Both Blue Light and Abscisic Acid Responses in Arabidopsis [J]. Plant Physiology, 2007, 143(4): 1590-1600. Liu X, Yue Y, Li B, et al. A G Protein-Coupled Receptor Is a Plasma Membrane Receptor for the Plant Hormone Abscisic Acid [J]. Science, 315. Santner A, Estelle M. Recent advances and emerging trends in plant hormone signaling [J]. Nature, 2009, 459(7250): 1071-8. Plakidou-Dymock S, Dymock D, Hooley R. A higher plant seven-transmembrane receptor that influences sensitivity to cytokinins [J]. Current Biology, 1998, 8(6): 315-324. Apone F, Alyeshmerni N, Wiens K, et al. The G-Protein-Coupled Receptor GCR1 Regulates DNA Synthesis through Activation of Phosphatidylinositol-Specific Phospholipase C [J]. Plant Physiology, 2003, 133(2): 571-579. Hamm, H. E. The Many Faces of G Protein Signaling [J]. Journal of Biological Chemistry, 1998, 273(2): 669-672. Logothetis D E, Kurachi Y, Galper J, et al. The βγ subunits of GTP-binding proteins activate the muscarinic K+ channel in heart [J]. Nature, 1987, 325(6102): 321-326. Ford C, Skiba N P, Bae H, et al. Molecular basis for interactions of G protein beta gamma subunits with effectors [J]. Science, 1998, 280(5367): 1271-1274. Rondard P, Iiri T, Srinivasan S, et al. Mutant G protein alpha subunit activated by G beta gamma: a model for receptor activation? [J]. Proc Natl Acad Sci USA, 2001, 98(11): 6150-6155. Chuang D M, Costa E. Evidence for internalization of the recognition site of beta-adrenergic receptors during receptor subsensitivity induced by (-)-isoproterenol [J]. Proceedings of the National Academy of Sciences, 1979, 76(6): 3024-3028. Skolnick J, Gao M, Roy A, et al. Implications of the small number of distinct ligand binding pockets in proteins for drug discovery, evolution and biochemical function [J]. Bioorganic & Medicinal Chemistry Letters, 2015, 25(6): 1163-1170. MartíSolano M, Schmidt D, Kolb P, et al. Drugging specific conformational states of GPCRs: challenges and opportunities for computational chemistry [J]. Drug Discovery Today, 2016, 21(4): 625-631. Guo Z, Li B, Cheng L T, et al. Identification of Protein-Ligand Binding Sites by the Level-Set Variational Implicit-Solvent Approach [J]. Journal of Chemical Theory and Computation, 2015, 11(2): 753-765. Thathiah A, Strooper B D. The role of G protein-coupled receptors in the pathology of Alzheimer's disease [J]. Nature Reviews Neuroscience, 2011, 12(2): 73-87. Huang J, Lakkaraju S K, Coop A, et al. Conformational Heterogeneity of Intracellular Loop 3 of the μ-Opioid G-Protein Coupled Receptor [J]. The Journal of Physical Chemistry B, 2016: acs.jpcb.6b09351. Hauser A S, Chavali S, Masuho I, et al. Pharmacogenomics of GPCR Drug Targets [J]. Cell, 2017, 172(1-2): 41-54. Marinissen M J, Gutkind J S. G-protein-coupled receptors and signaling networks: emerging paradigms [J]. Trends in Pharmacological Sciences, 2001, 22(7): 0-376.